San Salvador (Agenzia Fides) – "Those who offer themselves for love of Christ to serve the poor, will live like the grain of wheat which dies only apparently ": Fides was told by Mons. 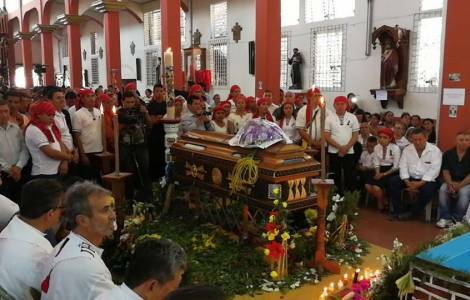 William Ernesto Iraheta Rivera, during the funeral of Father Walter Osmin Vásquez, killed when he went to a village to celebrate the Coena Domini mass on Maundy Thursday. Bishop Iraheta Rivera quoted the words of a homily given by Archbishop Oscar Arnulfo Romero, soon to be canonised. Father Osmin Vásquez was shot dead on 29 March, only days after the anniversary of the martyrdom of Archbishop Romero. Father Walter Osmin Vásquez, aged 36 from the diocese of Santiago de Maria, was assistant parish priest in Usulután. That Holy Thursday Father Walter " participated in the Chrism Mass in Santiago de Maria with the renewal of priestly vows, was assassinated on the day dedicated to priests " we read in a report sent to Fides and signed by the archbishop of Salvador, Mons. José Luis Escobar Alas, who adds: "It is necessary to know the truth and to obtain justice so that similar events will not be repeated ". The Catholic community all over the country, out of devotion and commitment for justice connected the two events: before becoming archbishop of San Salvador, monsignor Romero between 1974 and 1977 served as Bishop of Santiago de Maria, the diocese of Father Walter Osmin Vásquez. The diocese is one of the poorest in the mountain area of the country, where the martyred Archbishop said he had seen dire poverty, an experience which marked the rest of his life. Testimony sent to Fides says the example of Romero continues to inspire and bear fruit in new witnesses to the faith in El Salvador.